청자 철채퇴화삼엽문 매병(靑磁 鐵彩堆花蔘葉文 梅甁)은 고려시대 만들어진 매병으로 높이 27.5㎝, 아가리 지름 5㎝, 밑지름 9.5㎝이다. 목이 짧고 각진 아가리를 가졌는데, 목에서 어깨와 몸체에 이르는 선이 과장되지 않았고, 몸체에서 밑부분까지 홀쭉해지면서 거의 직선에 가깝게 내려오고 있다. 청자에 사용되는 바탕흙 위에 철사 안료를 칠하고(철채), 무늬 부분만 얇게 파낸 뒤 그 위에 흰색 분장토로 무늬를 그렸다. 이처럼 철채에 흰 그림을 그린 경우는 드물다. 거의 검은색에 가까운 철채의 색과 풍만하고, 아름다운 어깨와 몸통 부분에 흰색 삼(蔘) 잎을 단순하고 소박하게 그려, 대비와 조화를 잘 이루고 있다. 이러한 철채 자기는 그 수가 매우 적으며, 가마 또한 분명하지 않다. 다만 강진 대구면 가마에서 채집되고 있어, 그 곳에서 일반 청자와 동시에 생산 된 듯 보인다. This Celadon Prunus Vase made in Goryeo period is 27.5 cm in height, 5 cm in mouth diameter and 9.5 cm in bottom diameter. It has an angular short-neck mouth and the line passing the shoulder and the body from the neck is not excessive, while the line from the body to the bottom is almost straight. On the base clay to be used for celadon, iron pigment is applied, on which the pattern is inlaid thinly and brushed on it with white slip. This kind of drawing in white on iron pigment is rare. It has good contrast and harmony between the almost black color of the iron pigment and the simple and humble white color of the ginseng leaf pattern on the beautiful shoulder and body. 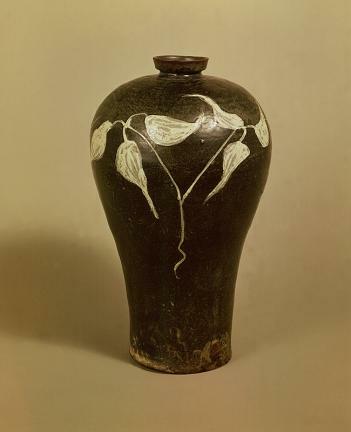 There are few cases of such an iron underglaze, and the original kiln is not known for certain, but it is believed that this vase was made with regular celadons at the kilns in Daegu-myeon, Gangjin.